This unit offers all of the functionality of the Pro Digital, but comes complete with a remote control. 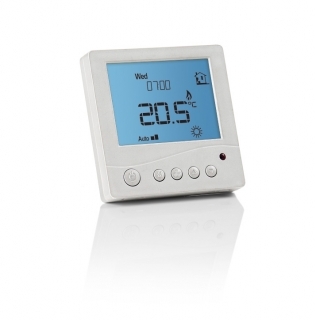 Available in your choice of silver or white, the unit can be flush mounted in a galvanised steel socket and offers three modes of temperature sensing (air, floor, or a combination of air and floor). The unit can be programmed with four daily set points, so that you can adjust each day of the week to be different. The digital display has a stylish blue back light and features a manual override, as well as a holiday setting.